Review the activities before using them with your class and determine how to best use them in your own class/school situation. The activity directions provided to the student for using the simulation are detailed, but may require some additional explanation from you before your students attempt the activities. No special equipment is required. These activities are browser-based. Your students will need Internet-ready computers, as close to one-student-per-computer as possible. If computer access is limited and small groups are necessary, keep the group size to a maximum of three students per group for the best participation by all students. Including time for the teacher to introduce the topic, student time-on-task, and class discussion of student findings upon completion, the activity should take approximately 60 minutes. Earthquakes and volcanoes have important scientific and historical significance. This unit focuses on the connections between earthquake location, depth, and magnitude as they relate to the locations and types of Earth's tectonic plate boundaries. 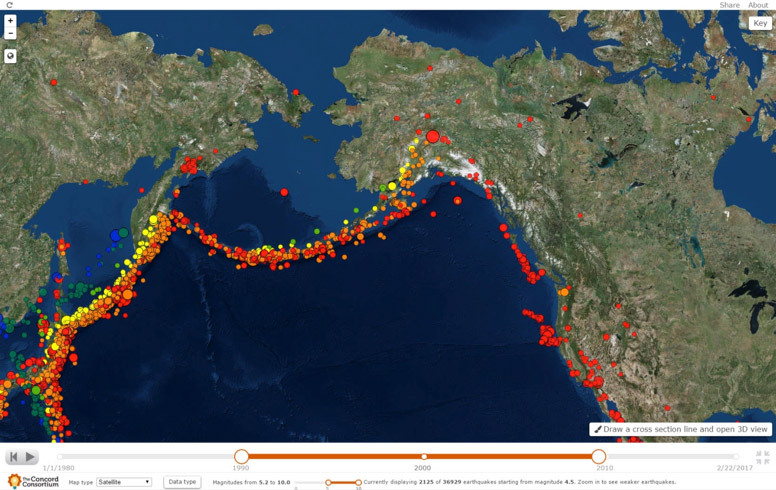 The first activity, "Comparing Earthquake Depth and Magnitude," introduces students to an earthquake data bank and allows students to explore the question, "Are there patterns to the depths and magnitudes of earthquakes around the world?" In the next activity, "Earthquakes Around the World," students begin to link earthquake and volcano location patterns to plate tectonics, answering the question, "Where do most earthquakes and volcanoes occur in the world and why?" In the third activity, "Investigating Plate Boundaries," students investigate plate boundaries in three dimensions and answer the question, "How does the direction of plate movement relate to the patterns of earthquakes observed around the world?" Students, like everyone else, may have misconceptions about earthquakes. For instance, students may have heard that large earthquakes only happen during certain times of the day or that certain weather conditions are linked to earthquakes. Neither of these ideas is true. Earthquakes occur along faults deep beneath Earth's surface. They are not affected by weather or time of day. Another common misconception about earthquakes is the belief that small earthquakes occurring along a fault help prevent or reduce the magnitude of future large earthquakes. Yes, small earthquakes release some of the energy built up along a fault. However, a large earthquake represents an enormous amount of energy — many times more energy than a small earthquake. It would take 32 magnitude 3.0 earthquakes to release the same amount of energy as one magnitude 4.0 earthquake. And it would take 1000 magnitude 3.0 earthquakes to cancel out the energy in one magnitude 5.0 earthquake. Small earthquakes indicate that a fault line is active, but they do not affect the risk of future large earthquakes along that fault or significantly reduce the magnitude of future quakes. Students recognize that macroscopic patterns are related to the nature of microscopic and atomic-level structure. They identify patterns in rates of change and other numerical relationships that provide information about natural and human designed systems. They use patterns to identify cause and effect relationships, and use graphs and charts to identify patterns in data. Students observe time, space, and energy phenomena at various scales using models to study systems that are too large or too small. They understand phenomena observed at one scale may not be observable at another scale, and the function of natural and designed systems may change with scale. They use proportional relationships (e.g., speed as the ratio of distance traveled to time taken) to gather information about the magnitude of properties and processes. They represent scientific relationships through the use of algebraic expressions and equations. Students explain stability and change in natural or designed systems by examining changes over time, and considering forces at different scales, including the atomic scale. Students learn changes in one part of a system might cause large changes in another part, systems in dynamic equilibrium are stable due to a balance of feedback mechanisms, and stability might be disturbed by either sudden events or gradual changes that accumulate over time. Scientist use a sensitive device called a seismograph to measure and record the shaking of Earth’s crust associated with an earthquake. The amount of shaking is used to determine an earthquake’s strength, or magnitude. Where on Earth do most earthquakes occur? Most, but not all, earthquakes occur along plate boundaries. On a map, those earthquakes may appear to be located on either side of the plate boundary. What is the relationship between earthquakes and volcanoes? Both earthquakes and volcanoes are most often located along plate boundaries. There are earthquakes that occur within plates and away from plate boundaries. Similarly, there are volcanoes that occur over hot spots within plates and away from plate boundaries, such as the volcanoes that have formed the Hawaiian Islands chain. Explain the difference between convergent and divergent boundaries. Convergent boundaries form where two tectonic plates move toward each other. Divergent boundaries form where two tectonic plates move away from each other and new crust is formed. Do earthquakes and volcanoes generally correspond to plate boundaries? Most, but not all, of Earth’s earthquakes and volcanoes are located along plate boundaries. How might you explain the volcanic eruptions that occur away from the plate boundaries, such as the ones that occur in the middle of the Pacific Ocean? There are hot spots in Earth’s upper mantle where hot material rises. These hot spots are not found at plate boundaries. When a tectonic plate moves over one of these hot spots, volcanic eruptions can occur, forming volcanoes such as the ones found in the middle of the Pacific Plate/Pacific Ocean. Is there a relationship between the magnitude of an earthquake and the type of plate boundary on which it occurs? The largest and deepest earthquakes occur at convergent plate boundaries where one plate is colliding with another. The numerous, shallower earthquakes that occur at divergent boundaries are usually smaller in magnitude. Where do most earthquakes occur in the world? Most earthquakes occur along plate boundaries. Most volcanoes are also found along or near plate boundaries. In 2011 a 5.8 earthquake occurred near Washington, D.C. Since there is no plate boundary near there, how would you explain this quake? Not all earthquakes are associated with plate boundaries. Earthquakes can also happen within plates along smaller faults. Movement along small, buried faults can cause earthquakes in areas that do not normally have earthquakes, such was Washington, D.C.
Earthquakes are caused by the sudden movement of rocks along a fault. We are most familiar with the threat of earthquakes that occur at large faults associated with plate boundaries. For example, California’s San Andreas fault is located along the transform plate boundary between the Pacific Plate and the North American Plate. There are many other faults associated with that plate boundary and earthquakes occur along many of them. There are also a number of smaller faults, located all over the United States. If you look at an interactive fault map of the United States, you can see where many of the smaller faults are located in the western United States. In the eastern United States, most of the faults are buried and do not reach the surface. Energy can build up along a fault as rocks on one side of the fault try to move relative to rocks on the other side of the fault. When the rocks eventually slip, that energy is released as an earthquake. There are three types of faults. A normal fault occurs when the rock above the inclined fault plane moves down relative to the rocks below the fault. A reverse or thrust fault occurs when the rock above the inclined fault moves up relative to the rocks below the fault. In strike-slip faults, the two blocks of rock slide sideways along the fault, without either side moving up or down. Go to the USGS site for more information on earthquakes suitable for your students. To create your own model of earthquakes in the United States, visit the USGS interactive earthquake map. Explore the settings (e.g., faults, magnitudes, base maps) found under the gear icon at the top right of the screen. If you were shown a Seismic Explorer model of earthquakes for a 10-year period from the first half of the 20th century and another model for a 10-year period from the 21st century, do you think you would be able to tell the difference? Explain. The two models would look practically the same. There would be a very similar number of earthquakes occurring over the two periods of time. The earthquakes would have similar magnitudes and would fall along plate boundaries in the same way. Barring an unusually large earthquake in a specific location during one of the two periods, it would probably be impossible to tell the two models apart. Are there any earthquakes near divergent boundaries with depths greater than 150 km? Why do you think this is? Earthquakes at divergent plate boundaries are usually shallow, with depths usually no greater than 30 km. Plates are not colliding or moving past each other at divergent boundaries. Earthquakes are produced by the normal faulting of shallow ocean crust rocks being pulled apart. What pattern of earthquake depths did you observe at convergent boundaries? For convergent boundaries where one plate is moving beneath the other, the actual boundary is an incline or curve. As viewed from above, the deepest earthquakes occur farthest from where the plate boundary is drawn on a map. The shallower earthquakes are found closer to that plate boundary. Intermediate depth earthquakes are found between. In the model, that gets displayed as a band of red circles (shallowest) at the boundary, followed by bands of orange, yellow, green, and blue (deepest) moving away from the boundary. Where do you see more large earthquakes: near divergent boundaries or near convergent boundaries? Why? More large magnitude earthquakes occur at convergent boundaries. Plates crash into each other or one plate moves under the other plate at a convergent boundary. Energy can build up when the two plates get stuck and then released as a large earthquake when the plates suddenly move. Plates move apart at divergent boundaries and the resulting gap gets filled with new crust. This movement results in small, shallow earthquakes. Which parts of the United States appear to have the most frequent earthquakes? Most earthquakes in the United States occur along faults associated with the plate boundaries that run along the Pacific coast, from southern California all the way to the Aleutian Islands along the southern coast of Alaska. Where are most volcanoes located in the continental United States? The volcanoes in the continental United States are associated with the same plate boundaries that run along the Pacific coast from California to Alaska. Active volcanoes are found associated with earthquakes; inactive volcanoes are often found more inland. Why don't earthquakes and volcanoes line up exactly with the plate boundaries? A plate boundary does not create a single fault. There is a zone of faults, mostly running parallel to the plate boundary. Earthquakes can occur on any of the faults associated with the plate boundary, even if the fault is several kilometers away from where the plate boundary is displayed on the map. Volcanoes associated with divergent boundaries happen at or very near the boundary itself, where the crust is spreading apart. Volcanoes associated with convergent boundaries happen tens of kilometers away from the plate boundary, where molten material from the subducted plate rises through the overlying plate and erupts. Compare the locations of large earthquakes to the locations of deep earthquakes. Do they occur together or are they found in different places? Explain your findings. The deepest earthquakes are found at convergent plate boundaries. The largest earthquakes are found at both transform and convergent plate boundaries. Therefore, both deep and large earthquakes occur at convergent plate boundaries. However, of the large earthquakes that occur at convergent plate boundaries, most of them are shallow. Yes. Larger magnitude earthquakes tend to occur at convergent plate boundaries. Divergent plate boundaries tend to only have smaller magnitude earthquakes. Why is it easier to predict where an earthquake will occur than it is to predict when it will occur? Fault locations are often known along plate boundaries. 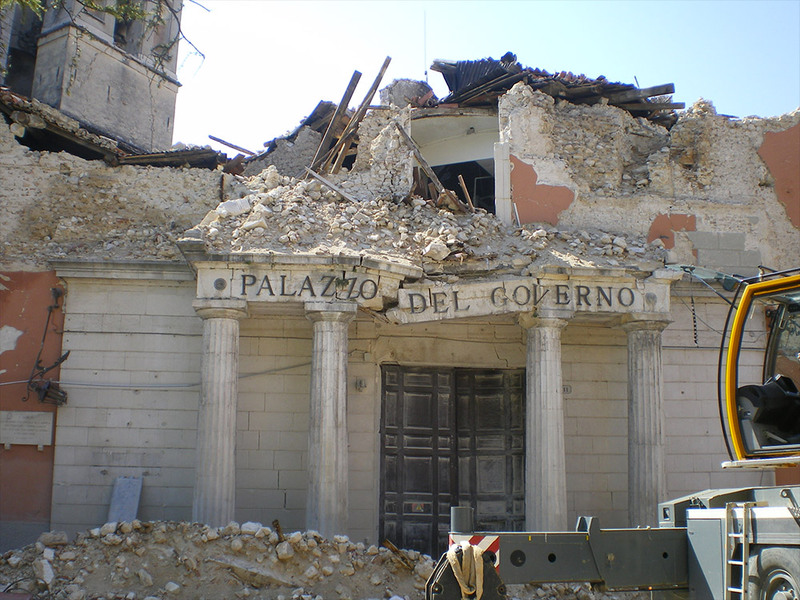 Scientists can look at historical records and see that earthquakes along a fault happen at a regular interval. They may know that an earthquake is more likely to happen at one area of a fault than another. They can even measure strain along the fault and know when the earthquake risk is increasing. However, scientists still have no good way of predicting when movement will occur along the fault, triggering an earthquake. How does the movement of plates along a divergent boundary account for the patterns of earthquakes you saw near Iceland? Explain. The earthquakes observed along divergent boundaries tended to be small and shallow. The plates are regularly stretching and pulling apart. Plates are not trying to move past each other, so the energy required for larger magnitude earthquakes isn’t stored. How does the movement of plates along a convergent boundary account for the patterns of earthquakes you saw on the west coast of South America? Explain. Earthquakes along convergent boundaries can occur at any depth. If one plate is being subducted beneath the other, earthquakes will happen at different depths along the curved plate boundary depending on where the plates end up slipping. How does the movement of plates along a transform boundary account for the patterns of earthquakes you saw? Explain. At transform plate boundaries, the plates try to slide past each other and get stuck. Earthquakes that occur at transform plate boundaries are shallow, but their magnitude can vary from small to very large and destructive. Which plate movements tend to produce the strongest earthquakes? Movements along both convergent and transform plate boundaries can produce equally strong earthquakes. Those that happen along transform boundaries tend to be more destructive since the energy released is closer to Earth’s surface. Compile lists of local earthquakes or earthquakes with some other interesting feature (e.g., U.S. earthquakes with magnitude greater than 6.0 over the past 100 years). Have students put the earthquake data into a spreadsheet. Students can sort the data to see if there are patterns. Where did most of the earthquakes occur? Create a map of an area that contains both earthquakes and volcanoes. Data would include latitude and longitude for location, magnitude and depth for the earthquakes, and recent activity status for volcanoes. Do students see earthquake activity associated with volcanoes?